because aquatic mollusks derive a large fraction of their considerable calcium needs by absorption directly from the external medium. CaCO3 is necessary for shell deposition and growth, and calcium is important in general fluid and electrolyte balance. 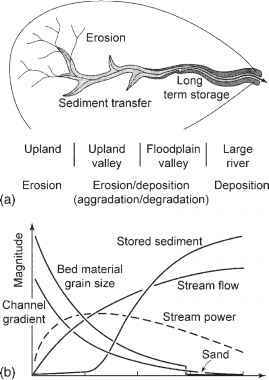 Alkalinity is widely used as a surrogate for stream fertility and is thought to influence the productivity of fish populations via their food supply (Cooper and Scherer 1967). 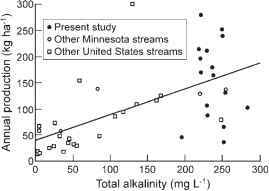 Compiling data on salmonid production and stream alkalinity from numerous studies in the United States, Kwak and Waters (1997) demonstrated a statistically significant but nonetheless imperfect relationship (Figure 4.6). However, their own data from 13 southeastern Minnesota streams did not show any dependence of salmonid production on stream alkalinity, which the authors suggest may be due to the modest range of alkalinity values among sites as well as the influence of additional variables including temperature and biological interactions.